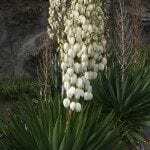 I have two yucca plants about 1,800 mm high in a shady position in the garden which are about 30 years old and have never flowered. Is there a method of making them flower? They are most likely not blooming due to the fact that they do not have enough sunlight. These plants need sunlight. Right now, they are likely getting enough to grow well, but not enough to bloom. You may want to see if you can thin the shade some and this will help to get them blooming.